Do You Know the Real Story Behind ‘Sound of Music’? A video of almost 200 people taking over Antwerp Train Station in Belgium in a carefully choreographed dance to the Do Re Mi song which Maria sings in the Sound of Music has reached over 1 million hits. While people, including myself, like to watch viral videos, this one seems to have struck an especially emotional chord with all those who’ve watched it. This may have been just a publicity stunt for a reality show, but no one seems to be bothered as it reminds most of us of our childhood, and that anyone can win in the face of evil. But after watching the YouTube, it got me thinking about the real Maria von Trapp, and how close the movie portrayed her. Maria was born on a train while traveling to a hospital in Vienna, Austria, on January 26, 1905, and was orphaned by her seventh birthday. She was then raised by her uncle, a court-appointed guardian. She described him as a passionate socialist, and extremely anti-Catholic. Maria continued to go to the Sunday service, and when she graduated from college at the age of 18 in 1923, she entered the Nonnberg Benedictine Convent in Salzburg as a candidate for the novitiate. Over time, her health had suffered as she was not getting the exercise and fresh air to which she was accustomed. While at the abbey, Maria had taken up the post of schoolmistress and started educating the local children. When Georg von Trapp approached the Abbey requesting a teacher (not a governess) for his sick daughter, Maria was chosen, not only because of her training and skill as a teacher, but also out of concern for her health. She was only supposed to remain with the von Trapps for 10 months, then she would have formally entered the convent. Young Maria was gravely sick from scarlet fever, which had claimed her mother’s life. Maria tutored young Maria and had a caring and loving relationship with all the children. It was during this time Georg fell in love with Maria, asking if she would stay with him and become a second mother to his children. Maria said: “God must have made him word it that way because if he had only asked me to marry him, I might not have said yes.” Maria and Georg then married in 1927; they had three children together — Rosmarie, Eleonore, and Johannes. In the early 1930s, during the worldwide depression, the family lost most of their money after their bank failed. It was at this time Maria dismissed most of their servants and started to take in boarders in an effort to survive the depression. It was also around the time when they were considering singing as a profession. Georg at first was reluctant for the family to perform in public, “but accepted it as God’s will that they sing for others,” daughter Eleonore said in a 1978 Washington Post interview. In the Salzburg Music Festival in 1936, the family won first place just as depicted in The Sound of Music movie. The Trapp Family Choir conducted a tour of Europe the next year and became famous across all of Europe, singing Renaissance and Baroque music, madrigals, and folk songs. In 1938 when Austria fell under Nazi rule, Georg refused to fly the Nazi flag on their house, and had declined a naval command. It wasn’t until the family had declined a request to sing at Hitler’s birthday party did they realize that they were on thin ice with the regime. It was when they became aware of the Nazis’ anti-religious propaganda and policies, and the brainwashing of children against their parents that they decided to leave their friends, family, estate, and all their possessions. 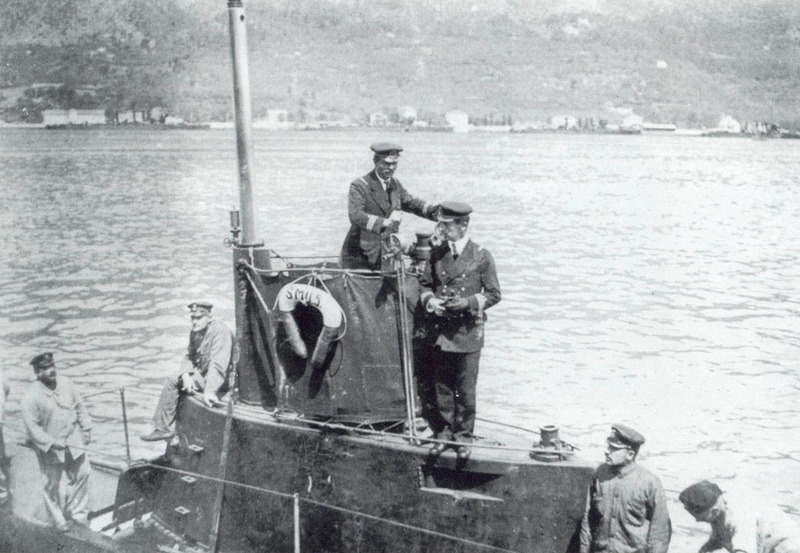 Even though they were offered fame as a singing group, a doctor’s position for Rupert, and a renewed naval career for Georg, the family decided they would not compromise their principles. Travelling by train with their musical conductor, Rev. 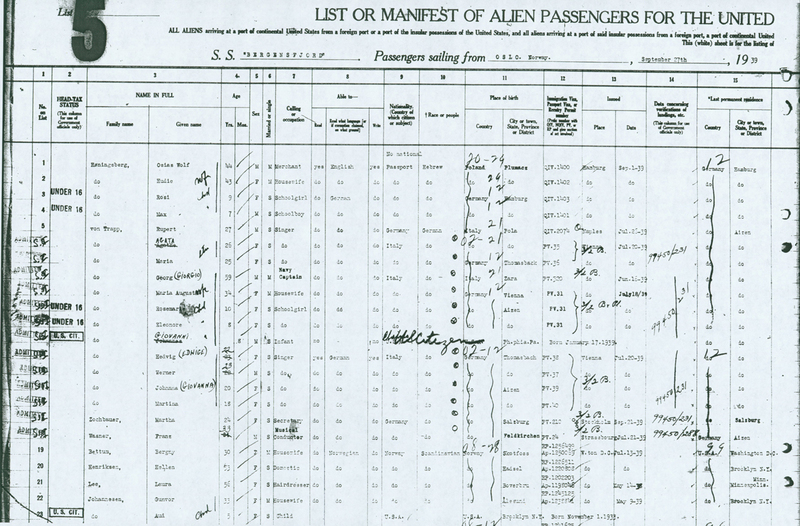 Franz Wasner, and secretary Martha Zochbauer, they left Austria for Italy in June. Georg was born in the Kingdom of Dalmatia, once part of the larger Austro-Hungarian Empire, so all he had to do was claim Italian citizenship… as could the rest of his family. They then went to London, and then by September left on a ship to New York to begin their concert tour in Pennsylvania. In the book The Story of the Trapp Family Singers that Maria wrote and which was published in 1949, she notes that they were released after a few days and began their next tour. 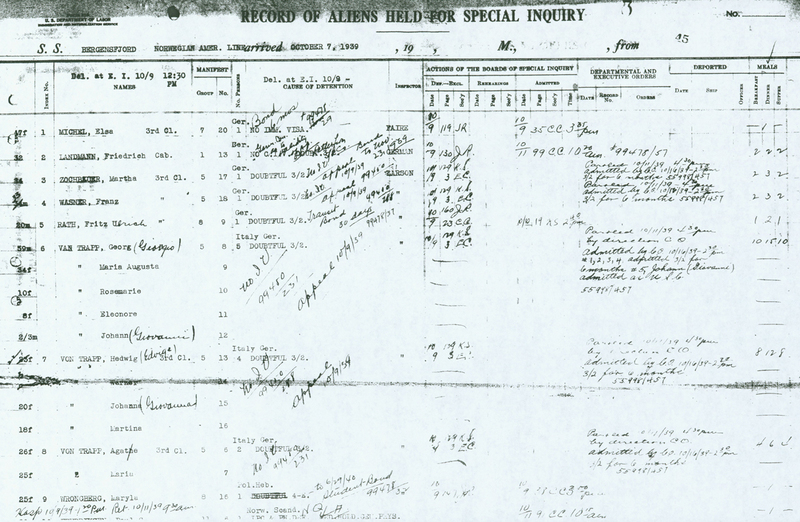 The family settled in Stowe, Vermont, in the early 1940s on a farm they had bought. When not on tour, the family would run a music camp on the property. 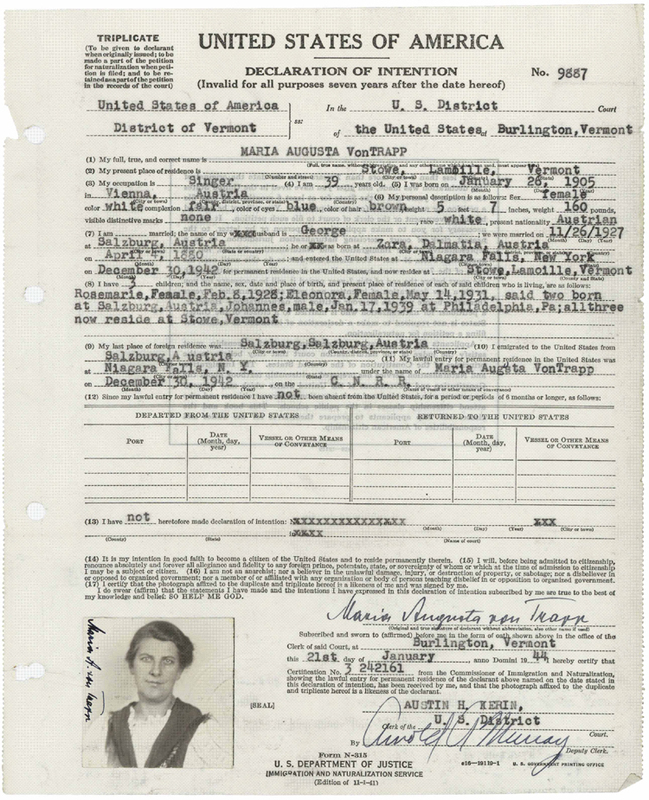 Then in 1944, Maria and her stepdaughters Johanna, Martina, Maria, Hedwig, and Agathe applied for U.S. citizenship, filing their declarations of intention at the U.S. District Court in Burlington, Vermont. 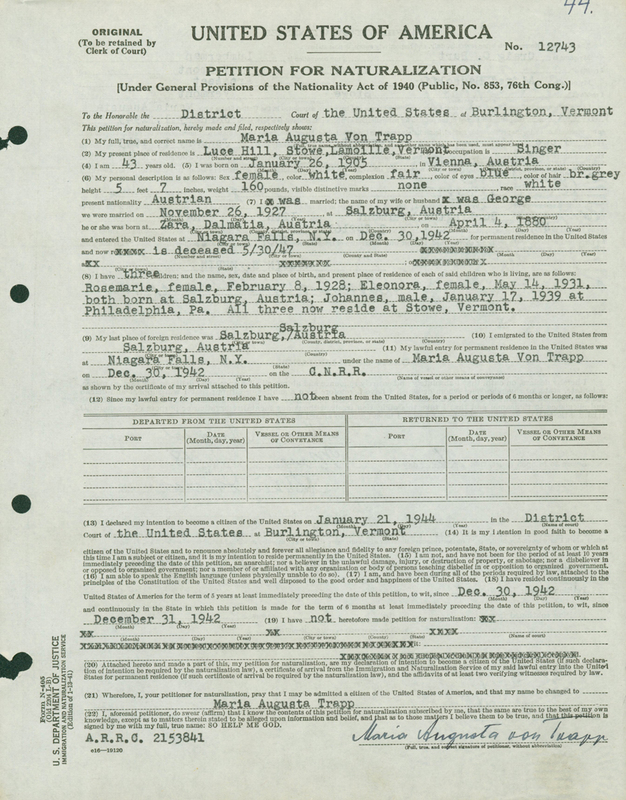 Georg never filed to become a citizen; while serving in the U.S. armed forces during World War II, Rupert and Werner were naturalized. Rosmarie and Eleonore received citizenship from their mother, and Johannes was born in the United States. Georg died in 1947, and was buried in the family cemetery on the property. Then in 1987, Maria died, and was buried alongside Georg and Martina. The Trapp Family Lodge is still in operation today. Maria had sold the film rights to German producers, signing away her rights in the process. The American rights were then bought from the German producers. The family had little input in The Sound of Music; as a courtesy, the producers of the play did listen to Maria’s suggestions, but no substantive contributions were accepted. Maria said she was represented fairly accurately (although Mary Martin and Julie Andrews “were too gentle-like girls out of Bryn Mawr,” she told The Washington Post in 1978), and was grateful that there wasn’t any extreme revision of the story she wrote in The Story of the Trapp Family Singers. However, she was not pleased by the way her husband was portrayed.